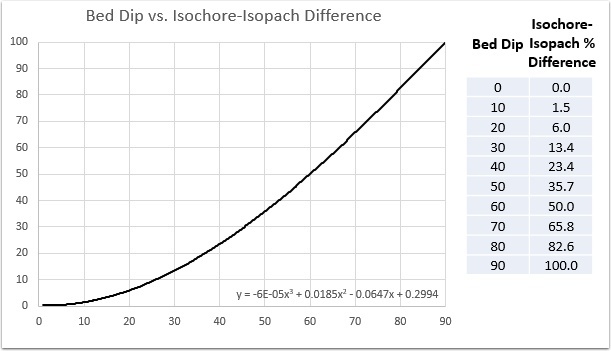 Isopach and isochore describe a map showing the thickness of a unit in the subsurface. Both types of maps show the thickness between two mapped surfaces, but differ in how the thickness is measured. Isochore maps measure the thickness from a point on the upper surface straight down to the corresponding point on the lower surface. Isopach maps display the stratigraphic thickness between an upper and lower horizon. It is measured as the shortest distance between the two surfaces. 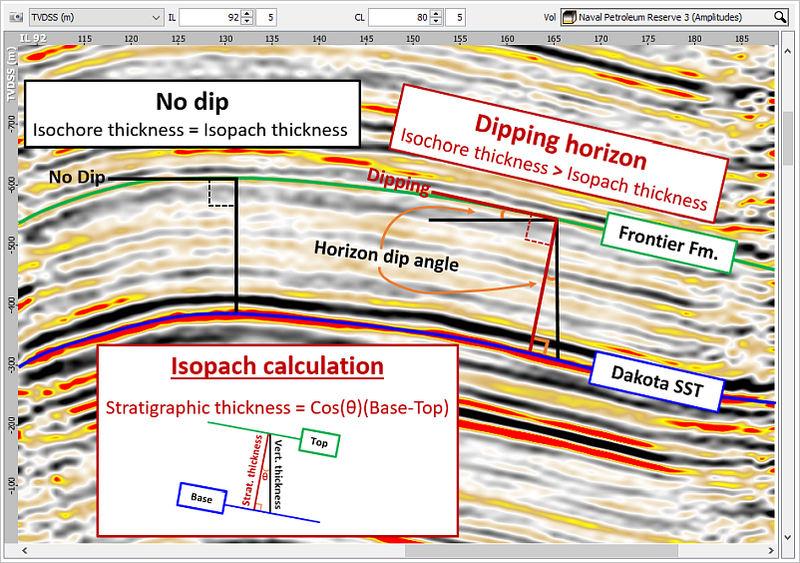 Isopach maps provide a more accurate picture of stratigraphic thickness, because it reflects the thickness of the deposited bed. To calculate the isochron, or time interval map, subtract the top horizon time from the base horizon time. For flat stratigraphy, this would also result in the isopach: vertical thickness is the same as stratigraphic thickness. 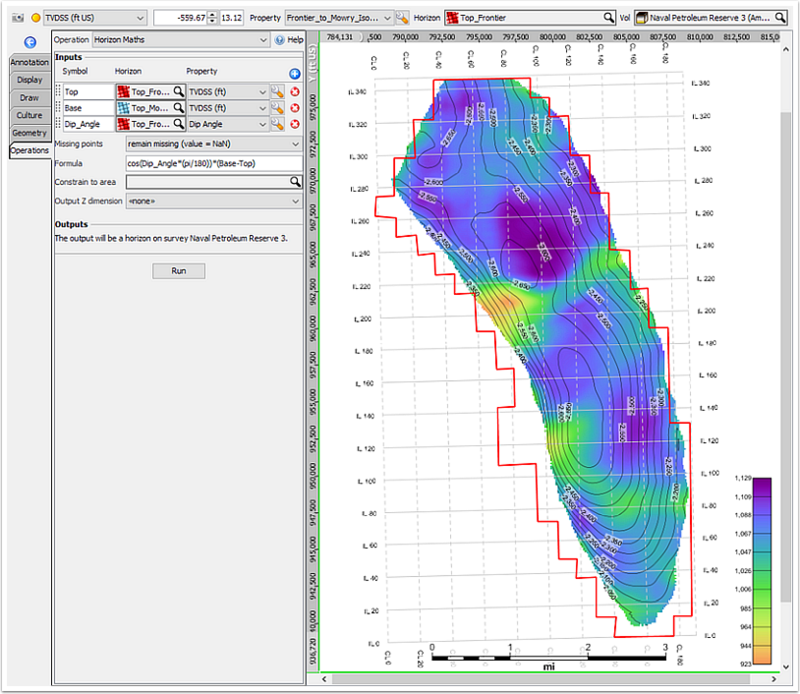 With increasing dip, the difference between vertical thickness and stratigraphic thickness measurements becomes larger. After data has been depth converted, isopachs maps show a more geologically accurate portrayal of stratigraphic interval thicknesses. 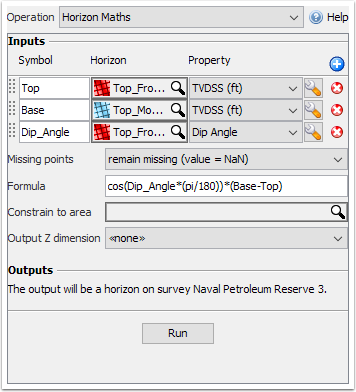 To generating an isopach map in Insight you’ll need two TVDSS horizons, along with a dip angle map for the top horizon. Dip angle is automatically calculated for depth horizons and can be found under the Property menu for your horizon. In this example, we will create an isopach for the Frontier Formation, an Upper Cretaceous unit from the Powder River Basin, Wyoming. This sandy unit contains shallow marine and fluvial facies and overlies the marine shale of the Mowry Formation. Using mapped horizons for the Top Frontier and Top Mowry, along with a dip angle map of the Frontier, we can create a stratigraphic thickness map for the Frontier Formation. In the Map view, click the Operations tab and select Horizon Maths from the Operation drop-down. Under Inputs, click the plus to add three horizons, these horizons will include your two depth horizons, along with your dip angle map for the top horizon. For the two depth horizons, select TVDSS as the property. For the second top horizon added, change the Property to Dip Angle. For output Z dimension, select <<none>> so that output horizon will display only in Map view. There are two options for how to save the result. Clicking ‘Create New’ will save the isopach map as a new horizon called Result:HorizonMaths. You can edit the name for the horizon by opening the ‘Configure Horizon’ window by double-clicking the horizon in the Control Panel. The other option is to save the output as a property of the top horizon by clicking ‘Add property’ This will allow you to view the the isopach by selecting it as a property in the ‘Property’ drop-down menu. This property can be viewed in 3D as well, as an isopach draped over structure. 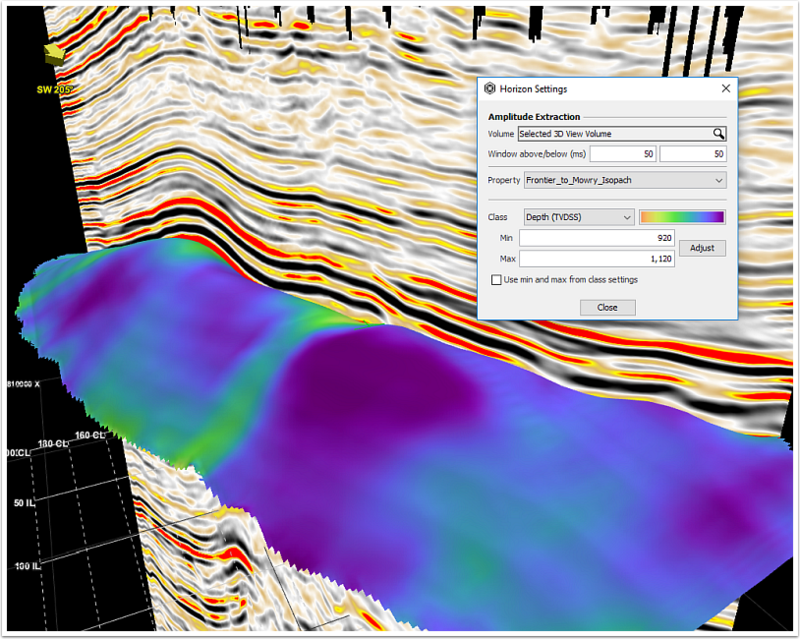 Overlaying depth structure contours can give a clear picture of where stratigraphic thicknesses occur in relation to structural highs. This can be done in the Map view > Display tab, where you’ll be able to turn on contours for a specific horizon. 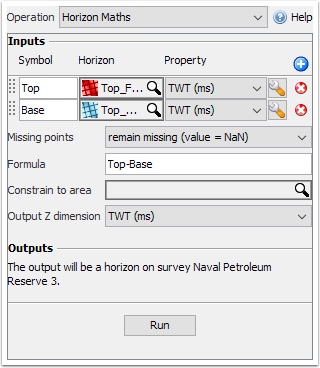 Under Contours, select the top horizon and set the Property to TVDSS, then adjust the contour parameters.